I love eating breakfast bars on busy mornings; it's like having your favorite bowl of cereal on-the-go. Making homemade bars vs buying the prepackaged kind keeps them healthy and allows you to mix and match flavors according to your tastes. The combination below is one of my favorites. Heat oven to 300 degrees. Line an 8- by 8-inch baking pan with parchment paper. Grease the paper with butter and dust with flour. In a large bowl, mix cereal, pecans, dried bananas, salt and flour. In a separate bowl, whisk together honey, egg whites and vanilla. Pour over cereal mixture and combine until cereal mixture is well coated. Spread mixture into the prepared baking pan and pat down evenly using your hands. Bake about 45 minutes or until bars are dry on top and light golden around the edges. Cool completely, lift out of pan and slice with a serrated knife into bars or squares. I am obsessed with pecans lately - these look great! Oh these look delicious! I bet my kids would love them too. I love a grab and go breakfast! Such a great, healthy snack! My kids would have fun making these with me! What a cute idea! My little cousins would love these, I may bring for thanksgiving! Can't go wrong with this snack. Great for running out the door. These look very healthy, filling, crunchy and delicious! Great way to start any morning. Such a delicious idea......cereal to go! Love that idea of having my favorite cereal on the go. So much easier to eat while walking hehehe. Great combination of flavors too! What a great idea to make your own cereal bars. I don't know why I don't already! These sound amazing with the pecans and dried bananas. 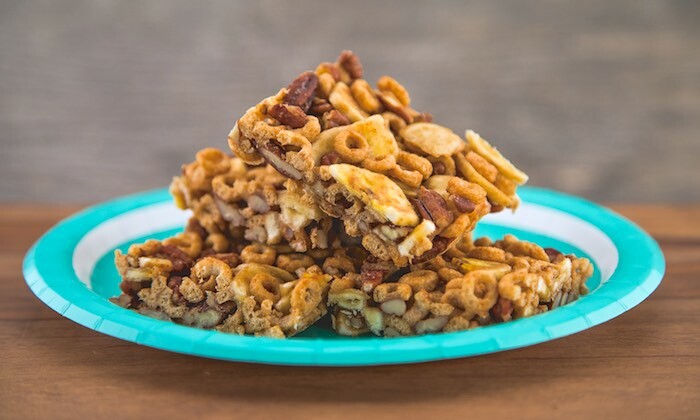 These cereal bars look fabulous! They are the perfect breakfast on the go treat...yum! I love cereal bars too, this sounds like a delicious combination! These look fantastic and fun to make! I think I will add some toasted coconut flakes, too!